“According to the talk show’s executive producer Rob Burnett, the spot was put together quickly. And on the down low. The wheels were set in motion soon after CBS offered “Late Show” a promo slot during the Super Bowl. “Dave had this idea, ‘What about getting Jay and Oprah together with me?’ and he wrote it,” Burnett explained to the Associated Press. 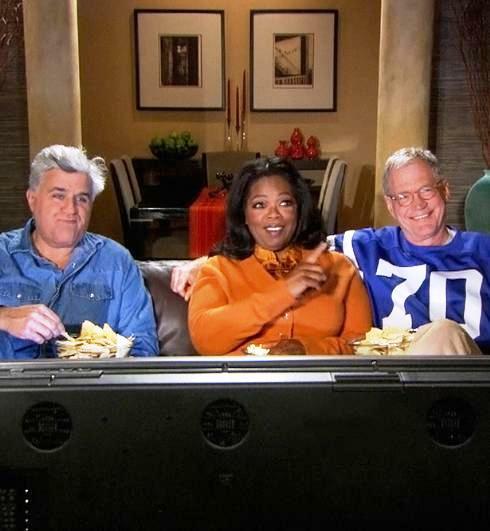 “We said, ‘This is too funny to pass up.’ First we called Oprah.” Then Leno was approached, and he, too, signed on. That was two weeks ago. The spot was filmed last Tuesday at the Ed Sullivan Theatre, home of “Late Show.” According to Burnett, Leno arrived in disguise: hooded sweatshirt, dark glasses and fake mustache. Filming took less than a half-hour, Burnett said. For now. It may be a different story after the Winter Olympics, when Jay Leno returns as host of the “Tonight Show” and his ratings battle with Letterman resumes. Wow, competitive adults acting like adults and being civil to each other. What a concept! 😉 Adding icing to the cake, after being rejected by trying to login with my username and password before this upgrade, after emailing one of the guys at wordpress, I actually received my ORIGINAL username back. Sweet!